New Illinois Gov. J.B. Pritzker got a warning of sorts from Moody’s ahead of the governor’s first budget address. The rating agency’s most recent report highlighted the usual crises Pritzker must tackle: ballooning pension debts and chronic budget deficits. Moody’s rates Illinois just one notch above junk largely due to the state’s finances and malgovernance. Moody’s says new revenue likely will be required to achieve stability, as you’d expect, because rating agencies love higher taxes. But for the first time, the agency has included outmigration among its top-three credit concerns. That matters because Pritzker’s number one prescription to “fix” Illinois is tax hikes, something that’s sure to accelerate Illinois’ out-migration trend and further erode the state’s tax base. These new comments are significant because Moody’s has long considered tax hikes a budget-balancing option for the state. That’s not surprising since Moody’s priority is the well-being of bondholders, not taxpayers. The agency’s ratings reflect the likelihood that bondholders get repaid – and tax hikes make repayment more likely. But that’s only true as long as tax hikes don’t destroy the tax base and, ultimately, make the repayment of bonds less likely. It appears the flight of Illinoisans has gotten so big that Moody’s can no longer ignore it. Which bring us back to Illinois’ usual problems. 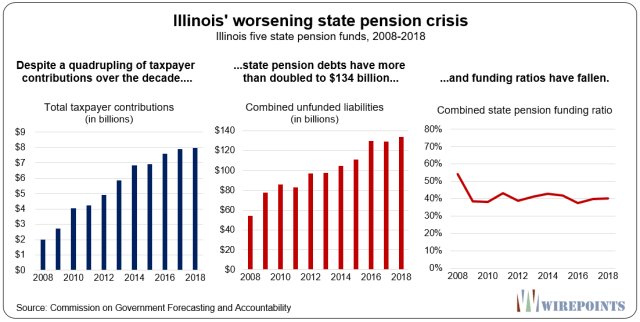 The ratings agency paints a grim picture, especially considering Illinois taxpayers have seen state pension debts grow by $80 billion over the decade despite a quadrupling in the amount of money they’re putting in. Illinois’ high tax rates, increasing out-migration, enormous debts and a near-junk credit rating should force Pritzker to pursue a constitutional amendment for pensions. A reduction in retirement debts – for both pensions and retiree health insurance – is Illinois’ only true option. But all indications show the governor is loathe to pursue an amendment. Instead, look for Pritzker to ignore Illinois’ conundrum and the flight of Illinoisans to continue.